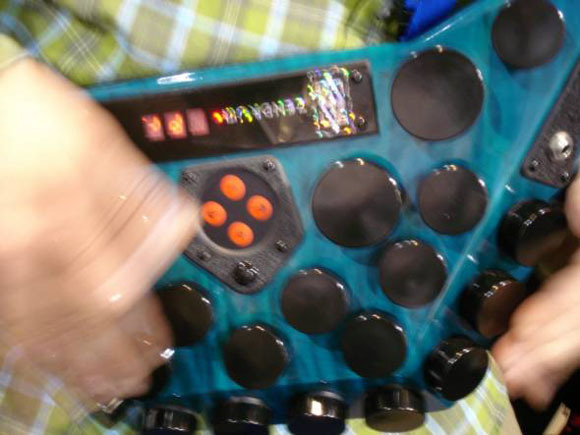 One of the most impressive instruments at NAMM this year wasn’t new: it was the Zendrum, a spectacular handmade MIDI drum controller. The Zendrum has been evolving gradually since the 1980s, but it’s brought to life by the latest drum samples in FXpansion‘s BFD drum sample library. That’s the fascinating thing that’s happening: as sample libraries get better, they become more demanding of controllers, and visa versa. Careful velocity sensitivity in the BFD samples (FXpansion were showing a new expansion pack) made the slightest tap on the Zendrum incredibly sensitive and realistic. Shown here: John Emrich, drummer, Zendrummer, and creator of the new Jazz & Funk BFD sound library (more from him in comments). All of the round protrusions on the Zendrum are touch-sensitive triggers. They don’t move; they simply respond to how hard you’re hitting them, and they do it really, really well. (They’re calibrated to filter out extraneous vibrations, like the roar of the NAMM show floor, so that even the slightest tap yields a responsive sound.) A masterful player can turn it into a phenomenal, handheld drum set. It’s eerie: I put on headphones and closed my eyes, and the combination of the Zendrum’s responsiveness, the skill of the player (i.e., not me), and the quality of the sound set made my mind wonder where the drum kit was hiding. 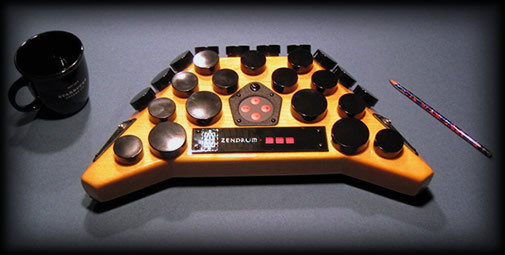 And, of course, since it’s a MIDI controller you can make those sounds as alien as the Zendrum looks. If you want to join the techno tribe of Zendrum players (and you’ll be in good company, both celebrity and oddball), prices range from about US$1200 to $1600. Not bad for a treasure of an instrument handcarved from wood. It makes me want to learn drumming. Or Zendrumming, I should say. Apple Surprises Mactel Developers with Logic?